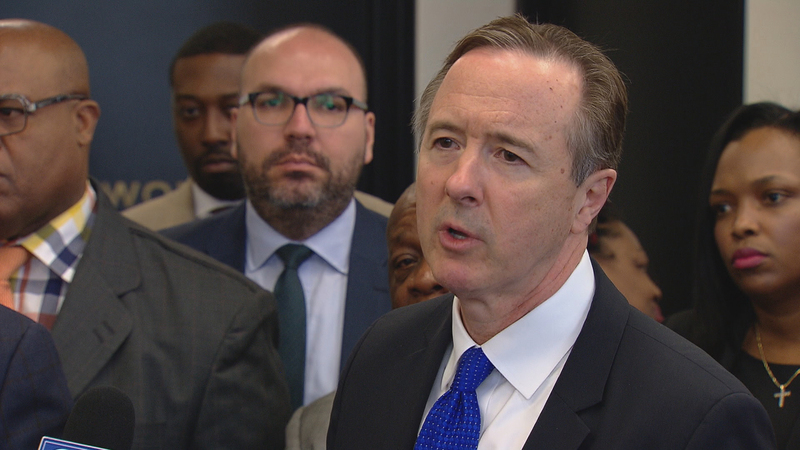 Chicago Public Schools’ inspector general says CPS CEO Forrest Claypool engaged in a “cover-up” and “repeatedly lied” during a monthslong investigation into an ethics code violation. In his full 90-page report released Thursday, Inspector General Nicholas Schuler urges the Chicago Board of Education to fire Claypool and discipline CPS General Counsel Ronald Marmer following a 16-month investigation. “The decision by Claypool to alter billing records while the (Office of the Inspector General) investigation was ongoing — and after Claypool told the public that he was happy to ‘walk the OIG through the process’ – escalated this to a full-blown cover-up and, thus, a termination case for him,” the report states. The contents of the memo were first reported by the Chicago Sun-Times and the Chicago Tribune on Wednesday evening. Schuler’s investigation determined Marmer shouldn't have been allowed to oversee district work conducted by the law firm of Jenner & Block LLP leading up to its civil rights lawsuit against the state of Illinois. Both Claypool and Marmer had previously worked at Jenner & Block, which was still paying Marmer through a severance package while he oversaw their work. Four in-house attorneys initially informed Claypool and Marmer that this constituted a violation of the board’s ethics guidelines. But the men instead sought additional opinions from two outside attorneys – Patrick Rocks and James Franczek, who each issued similar opinions to the in-house attorneys. Claypool admitted in a letter last month he made a “mistake” during an interview with Schuler’s office during the investigation. He apologized to the IG, saying he didn’t remember requesting those changes. A copy of Franczek's invoice showing alterations allegedly requested by Forrest Claypool. But in the report, Schuler states that Claypool “unequivocally, emphatically and repeatedly” denied making any such request, going so far as to say during one interview that he “runs a $5.6 billion operation, and ‘I’m not looking at freaking bills.’” The inspector general believes Claypool issued this letter in hopes of tainting the board’s reception of the final report by “falsely portraying lies on two separate occasions” as lapses in memory. Claypool has maintained Marmer did nothing wrong. He acknowledged the board’s rule prohibiting employees from overseeing contracts with entities with which they maintain business relationships, but felt it didn’t apply to this case because the work was being done pro bono and didn’t affect Marmer’s severance package. The report states Marmer’s infraction doesn’t necessarily warrant termination, but Schuler leaves that disciplinary decision up to the board, saying it can take action ranging from a “first and final warning” up to actually firing its general counsel. Schuler had previously taken the unusual step of addressing the board publicly during its December 2016 meeting, citing what he called “a serious negative development in the relationship between the board” and his office. At that time, Schuler claimed the board was blocking his investigation by asserting attorney-client privilege. Claypool has remained under fire from the Chicago Teachers Union, which again called on Mayor Rahm Emanuel to fire his schools chief following news of Schuler’s report. Emanuel issued a statement saying there’s no question Claypool “made a mistake,” but said he's standing by the CEO because he was “big enough” to stand up and apologize publicly for it. “Forrest deserves a lot of credit for his role in our schools. That’s his record and that is his passion,” Emanuel said. But Claypool has also been on the receiving end of criticism from a longtime ally, Ken Bennett, who on Wednesday called on the board to enact increased oversight over the CEO. And on Thursday, former interim CPS CEO Jesse Ruiz called on Claypool to step down. Sept. 22: Calls for the ouster of CPS CEO Forrest Claypool and General Counsel Ronald Marmer come on the heels of a leaked report alleging Marmer violated the district’s ethics code. Dec. 8, 2016: An investigation into whether or not the Chicago Board of Education’s top attorney violated a Chicago Public Schools ethics policy has been stalled, according to the district’s Inspector General Nick Schuler.